Oh my god, shoutout to Rex Morgan, M.D., for pulling off the first weird plot twist that I didn’t see coming a mile away in years. I’m not sure which possibility is funnier: that crude lout T.J. really is the evil half of a pair of identical twins and Rex is about to have an extremely civilized conversation with his brother on his flight home, or that T.J. was so embarrassed by his own behavior and subsequent run-in with the law that he’s made up a wildly improbable story about being someone else. 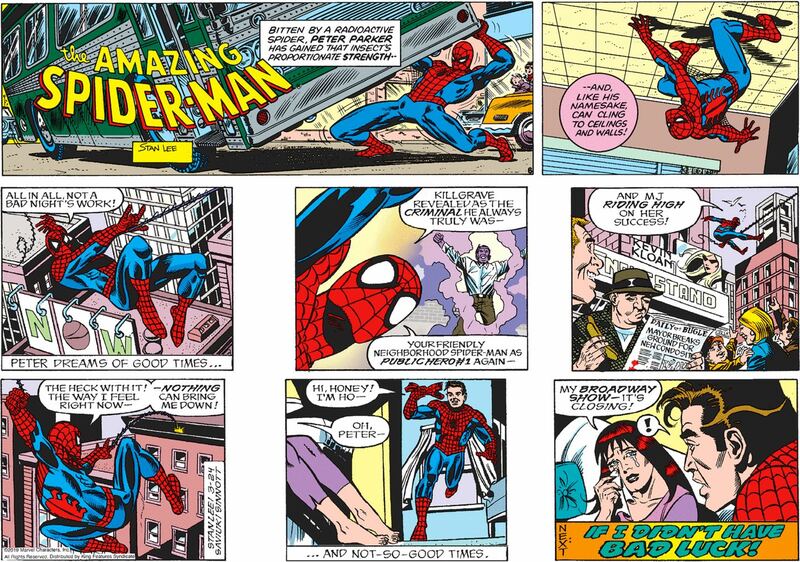 Whoops, you guys, I misread that article somehow and it’s actually today that’s the last day of Newspaper Spider-Man. Sorry if I made you mourn prematurely! Anyway, this is an amazing final strip, I think we can all agree. Again, there are two almost equally hilarious possibilities. One is that the ousted creative team, out of a sense of professionalism, decided to do a final strip that quickly resets the last 30+ years of continuity so that today’s strip will flow seamlessly into the coming reruns, setting aside for the moment the fact that a minute ago the Parkers were on their way to Australia. The other is that the writer and illustrator have simply come to feel as much contempt for this iteration of Spider-Man as I do, and wanted to ensure that, when the curtain closes on his universe, he’s left in a state of misery and poverty. Oh my goodness, “Arthur Z” is really … beloved TV star Danny DeVito? This is quite the scandal. What will Rhea Perlman think? I know that the inhabitants of agricultural communities are more prone to be “early to bed, early to rise” types than us city folk, but it’s a little weird that Snuffy and Loweezy are all snug in bed and it’s broad daylight outside, right? Look, I long ago gave up on trying to figure out how exactly the process operates behind the scenes of long-running legacy comic strips, so I’m not sure why we got two Family Circus panels in the last three years with different art but essentially the same joke. 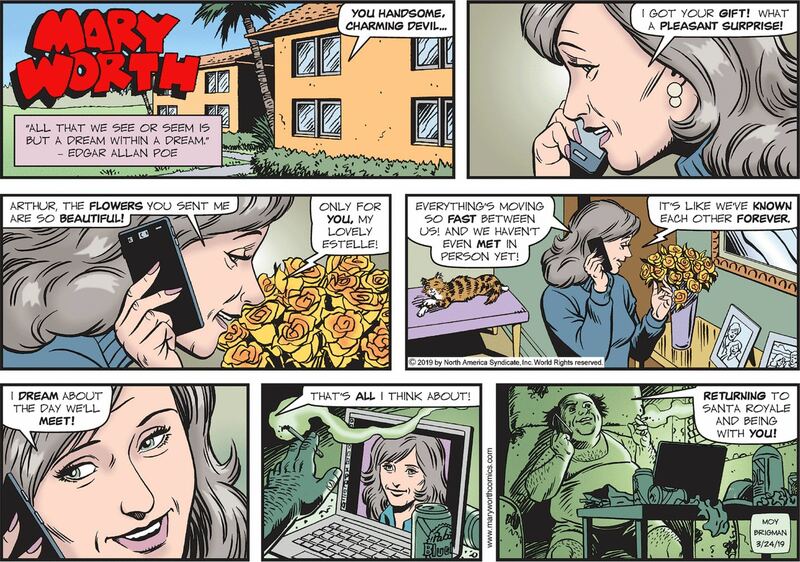 Is this just a case of someone unconsciously coming up with the same joke twice and then redrawing a Dolly-praying-before-bed panel, or, perhaps more likely, pulling out a different entry from the presumably fairly sizable collection of Dolly-praying-before-bed panels? Or are the two panels meant to be companion pieces? 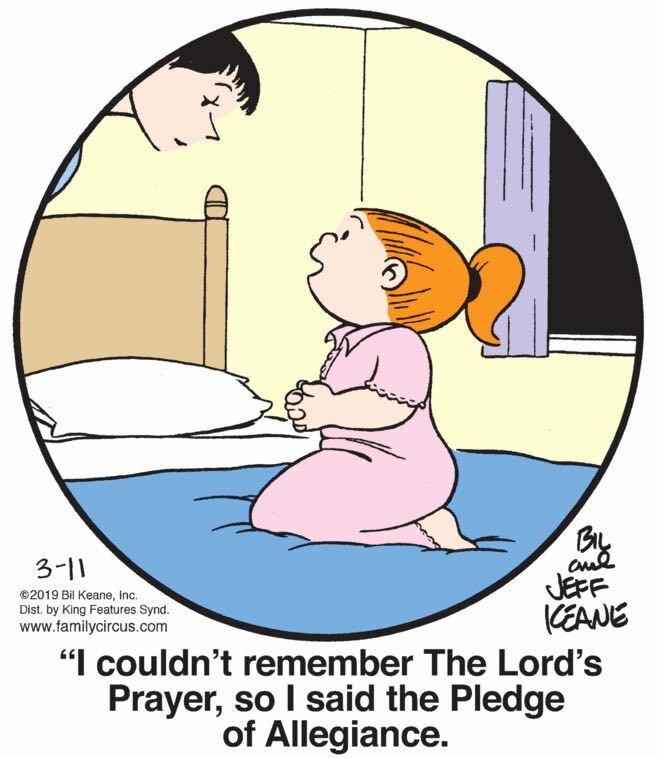 Back in 2016, Dolly said the pledge because she couldn’t think of any “new” prayers. Today, she couldn’t even remember the Lord’s Prayer, perhaps the most important in the Christian canon, because all the space in her mind dedicated to devotional rituals is now occupied by nationalistic display. Truly, the Keane Kompound is under seige! Hootin’ Holler is grindingly poor, with an economy revolving around subsistence farming, moonshining, and chicken theft, and it’s an open question as to how the various outsiders who come into town to serve professional roles eke out a living. Parson Tuttle makes it work with relentless and unapologetic grifting, but Doc Pritchart has it easier: his practice is just a front for nonstop Medicaid fraud. Slylock gets called down to the trailer park to mediate disputes between Reeky and Rachel an awful lot, but I’m pretty sure this is the first time Reeky’s version of events has actually been vindicated by Slylock’s keen eye and ratiocination prowess! I guess Rachel just became convinced that law enforcement would always take her side against “those people” (rats) and so she could get her nemesis in trouble for something he didn’t do. Of course, Reeky is going to be dragged down to the station tonight anyway, for the self-confessed crime of littering. Let this be a warning to you, creators! Your “fans” might share your social posts and back you on Patreon, but if you generate so much #content that it overwhelms their ability to consume it all within their lifetime, they’ll feel no compunction about teaming up with a one-eyed man you wronged to kill you with a flamethrower! Ha ha, it’s funny because Snuffy and Loweezy live in an impoverished, isolated community and there definitely aren’t more chairs where that one came from! Hope you like standing, Loweezy!